A novel nanophotonic chip has veen developed by an Australian-based research team that would enable the nano-control of light. This would provide a better understanding of black holes and allow the development of advanced optical technologies. The breakthrough nanophotonic chip can harness the angular momentum of light, paving the way for next generation optical technologies. (Image: RMIT University). 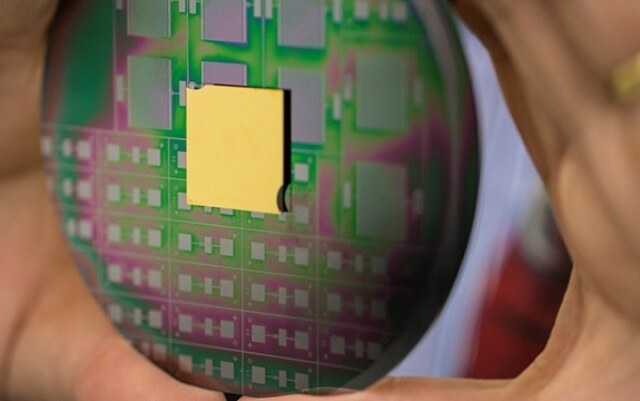 Scientists from Swinburne University of Technology and RMIT in Australia and Jinan University in China formed the research team that created the integrated nanophotonic chip, which can control the angular momentum (AM) of light at an unprecedented level. In addition to the potential to provide an improved understanding on the nature and evolution of black holes to scientists, it could also help generate, transmit, process, and record information of AM at a chip level. The AM of light quantifies the amount of dynamic rotation of a light beam, i.e., how it spins and twists on its optical axis while traversing in nearly a straight line. The study results have been reported online by the Science journal. If you send an optical data signal to a photonic chip it is critical to know where the data is going, otherwise information will be lost. Our specially-designed nanophotonic chip can precisely guide AM data signals so they are transmitted from different mode-sorting nano-ring slits without losing any information. The main focus for the researchers is realizing the potential of AM to improve the available capacity of optical fibers using an approach called “Multiplexing,” where parallel light channels are used. However, the lack of a naturally occurring material that can sense twisted light poses a major challenge in achieving AM multiplexing on a chip level. The researchers designed nano-grooves to integrate AM-carrying beams into various plasmonic AM fields. The different plasmonic AM signals were subsequently sorted and transmitted using the nano-apertures. As well as offering an innovative platform for the next industry revolution and providing promise for the advancement of the future ultra-broadband big data industry, the work also helps to understand black holes better. According to Professor Min Gu, Associate Deputy Vice-Chancellor for Research Innovation and Entrepreneurship at RMIT, the research paved the way for achieving complete control over twisted light that includes orbital angular momentum (OAM) and spin angular momentum (SAM). Due to the fact that rotating black holes can impart OAM associated with gravitational waves, an unambiguous measuring of the OAM through the sky could lead to a more profound understanding of the evolution and nature of black holes in the universe.